This post is sponsored by Love The Wild | Opinions are my own. Thanks for supporting the brands I love and trust. Let’s just point out the obvious for a moment: I don’t bring product reviews to the blog often. Or at all, really. But when I stumble upon something that I’m really into—something that aligns with my lifestyle and belief system—I’m happy to share it with you. And these high-quality, nutritious, and convenient microwaveable bowls from Love The Wild fit that bill. If you’re a seafood fanatic like I am, you’ve probably heard of Love The Wild before. Their approach to encouraging fish consumption is brilliant with easy-to-prepare frozen meal kits that boast restaurant-quality flavors while using sustainable and traceable species of fish. If you’re not a seafood fanatic (yet) but are been looking to incorporate more of it into your diet for the health benefits, Love The Wild is a fantastic place to start! Especially since introducing a tantalizing line of microwaveable bowls. A hectic schedule shouldn’t leave you hungry. Working from home definitely has its perks—but there are a few drawbacks, too. Like that whole isolation thing (though I have some wonderful one-way conversation with my cat); then there are instances where I lose track of time, forget to “clock out”, and accidentally work myself into a 12-hour shift. At last, and this may be the most common one for me, is ensuring that I get a proper break and eat an actual meal for lunch or dinner. I’ve often eaten crackers slathered in peanut butter as a meal due to being completely immersed in a project. Meal prep isn’t my forte (maybe one day! ), and frozen dinners always ended in disappointment—until now. High-Quality Ingredients and Traceable Fish. One of my favorite things about Love The Wild’s products is that you can taste the quality and freshness. This isn’t your typical frozen meal, friends. Last year, I teamed up with LTW to create this fall-inspired recipe using their meaty striped bass with red pepper almond sauce and it was un-believable. 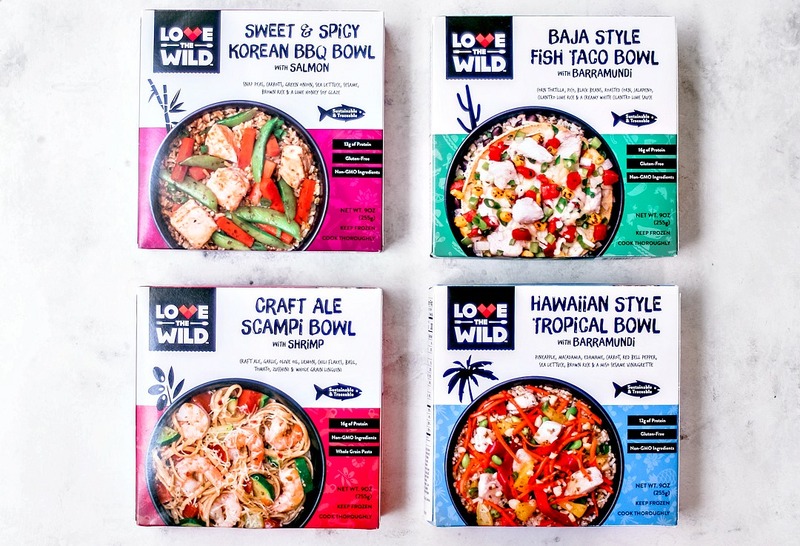 LTW’s microwaveable bowls come in four tempting varieties: Hawaiian Style Tropical Bowl with Barramundi, Sweet and Spicy Korean BBQ Bowl with Salmon, Craft Ale Scampi Bowl with Shrimp, and my personal fave, Baja Style Fish Taco with Barramundi. Each bowl brings restaurant-quality flavors, fresh ingredients, and healthy sustainable fish to your table. That’s the other thing I adore about Love The Wild: their seafood is traceable. You know where your food is coming from and you can feel good about your choices. On the back of each box, you’ll find information on the species, which sustainable farm it’s from, along with its location and owner, what kind of pen was used, and its certification. I can also promise you that these bowls are lunchroom-safe; your co-workers won’t be plugging their noses due to a fishy smell. Instead, they’ll likely be sniffing around your bowl and asking you where you got such a delicious smelling lunch. Have you given these glorious bowls a try? Would you? Let me know in the comments below! Yum! These sound like something I need to have on hand! I love finding brands you can trust! I think I need to try that fish taco bowl immediately! Oh my word these look delicious! I've been trying to find Love the Wild meals ever since I first saw you eating them-- and now I'm drooling again. I'll continue my hunt-- these look so good! These really do sound delicious and I love your disclaimer about them being workplace safe from offending lunchroom odors, lol. I haven't heard of these yet, but would definitely give them a try!